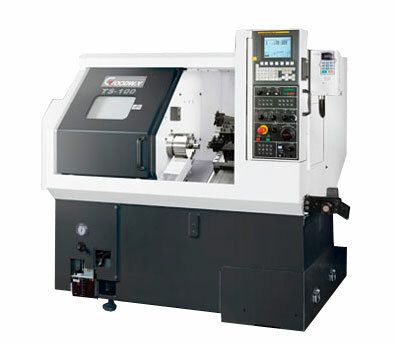 Packed with industry leading technology and top quality components, the GOODWAY TS-100 series turning centers combine power, strength, and speed to bring you The Ultimate Machining Power®. These high speed machines will easily accomplish the demanding turning applications of today and tomorrow. Furthermore, with available live tooling and C-axis capabilities; milling, turning applications may be completed in one single machine. 30˚slant design provides smooth chip disposal and easier operator access. The auto lubrication system delivers metered amounts of lubrication to the slide ways, ball screws,and vital components. Distribution is automatically shut off during idling to prevent waste. An adjustable timer on the standard chip conveyor allows the operator to set operation time according to the amount of chips being carried out of the machine. Thus, reducing coolant loss to a minimum. Coolant system with roll-out coolant tank and high-pressure coolant pump. *1 For M models only.